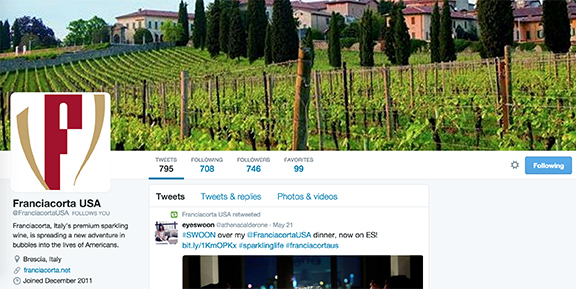 Above: The Franciacorta Consortium’s Napa-based PR first Balzac runs the @FranciacortaUSA Twitter. Beyond my Franciacorta Real Story tastings to be held next week in California (click here for details), there are a number of fantastic wine tasting and wine trade events where you can taste a wide range of Franciacorta wines over the next three months. The following event previews come from the FranciacortaUSA e-letter published by Balzac Communications, a Napa-based PR firm that represents the appellation in the U.S.
On July 16th, a dozen wine writers from around the country will join an online tasting via Twitter and taste and discuss the same set of Franciacorta wines on same day at the same time. Franciacorta will be poured for key sommeliers attending TEXSOM – the largest gathering of Master Sommeliers in the world, with 800 sommeliers and other trade in attendance. Immediately following the sommelier conference is a gathering of 500 wine educators from around the country, where Franciacorta will be poured at a Franciacorta-exclusive reception prior to the conference’s gala dinner. Previous post ← Thank you, New York City!